Unwieldy name aside, this was the first of GW’s new batch of snazzy – albeit outrageously over-priced – miniature-packed boardgames. 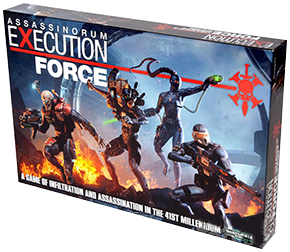 The game itself is a relatively simple co-op affair that sees assassins with special powers infiltrating a complex with a vaguely Latin-sounding name that is overrun by the forces of Chaos. In this case the re-used chaos renegade figures from the Warhammer 40,000 6th edition boxed set (sigh). These guys follow a simple AI sequence that sees them go on alert when they see an assassin or are attacked (and live). The goal of the game is to reveal rooms until you discover the two special rooms that let your assassins teleport to the temple and a final confrontation with the Big Bad, a chaos sorceror lord. Especially considering GW didn’t even design new figures for the bulk of the game, A:EF is too expensive for what it is compared to other games on the market, and replayability is a bit limited. But it’s a start, and at least GW is moving slightly outside the strict boundaries of their big tabletop games and waving in the direction of the golden years. With recent rumours that remakes of classics such as Blood Bowl and Necromunda (and even not-so-classic games like Dark Future) are on the way, it may be that some fresh thinking is afoot in Nottingham.